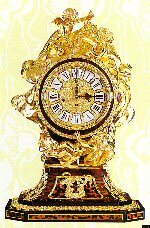 French Versailles Louis XVI style clock. Faithful reproduction. 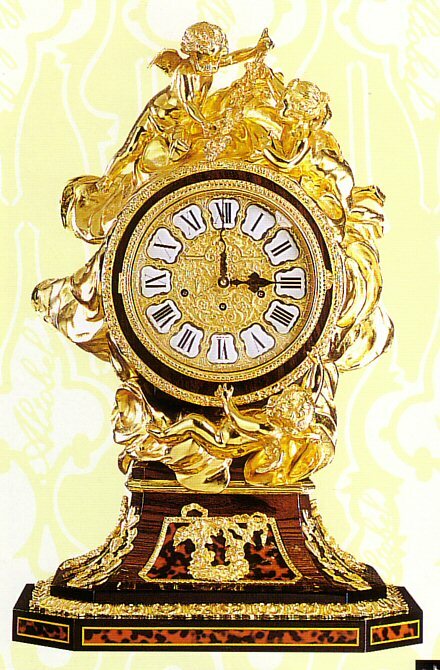 Fine "Boulle" inlay: brass and tortoise shell imitation. Fabulous 24kt gold plated bronzes hand made by a quality fusion of hidden wax. Kieninger J. German mechanical movement spring drive with 4/4 triple chime: Westminster, St. Michael, Whittington. Automatic night shut-off (10pm-7:15am) and 11 ruby jewels into an original Swiss escapement wheel. High polished diamond cut plates.